The Denver Dog Magazine – A License Plate That Save Lives! A License Plate That Save Lives! Excited animal lovers across the state were in line to purchase the new Adopt-a-Shelter-Pet license plate when Colorado Division of Motor Vehicle (DMV) offices opened their doors on January 3, 2011. Several DMVs ran out of the plates early that first day. Since then the plate has become the second fastest-selling revenue-producing Group Special Use license plate in the state! Of the 35 “Group Special Use” license plates (designed with a specific cause in mind), 20 require a donation in order to purchase them. The Adopt-a-Shelter-Pet plate is second only to the Breast Cancer plate in donations. The initiative to approve the Adopt-a-Shelter-Pet plate was spearheaded by Aspen resident Gary Sherman, who is guardian to two shelter dogs, Willow and Cyrus. The Adopt-a-Shelter-Pet license plate can be purchased directly from your local DMV; no certificate is required. The plate can be purchased during your annual renewal or any time during the year. You will receive credit for the time remaining between the purchase date and your annual plate renewal date. The cost to purchase a plate includes an initial $30 donation ($25 for renewals) to benefit homeless shelter pets in Colorado and the $50 standard fee for Group Special Use plates which goes to the state. You can also get a personalized Adopt-a-Shelter-Pet plate; contact your DMV to learn how. The attractive blue and yellow plate with dog and cat silhouettes in a paw print helps shelter pets in two important ways: first, it promotes awareness of Coloradan’s broad support of shelter adoptions (shelter dogs and cats were recently designated the official state pet) and second, revenue generated by license plate sales directly helps pets in Colorado shelters and rescue groups. Grants from license plate revenues are awarded to the neediest shelters and rescues to fund spay/neuter surgeries, veterinary medical care for both emergencies and non-emergencies, and microchip identification and registration for animals in their care. 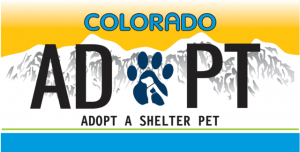 Adopt-a-Shelter-Pet license plate grants are administered by the Colorado Pet Overpopulation Fund (CPOF). Since 2011, CPOF has awarded 58 license plate grants, totaling over $250,000, to shelters and rescue groups in underserved areas of Colorado, helping more than 5,000 homeless animals. To learn more about CPOF or how to apply for a grant, visit: www.ColoradoPetFund.org. To purchase an Adopt-a-Shelter-Pet license plate, simply visit your nearest DMV!